A conversation with Jarett Diamond, Director of the Green Brewery Project. The Green Brewery Project (GBP) began as graduate research at the University of Michigan, and it has helped craft brewers in Washtenaw County become quite sustainable. 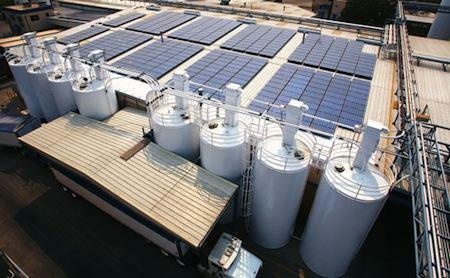 The GBP operates as a specialized sustainability consultant, equipping breweries in resource use monitoring, renewable energy options, brewing system design for efficiency, brewing schedule optimization, water efficiency and waste water management, and anything else you can think of relating to energy or water in a brewery. Jarett’s engineering expertise and knowledge of the brewing process have helped make Arbor Brewing Company (and their offshoot, Corner Brewery) leaders in sustainable beer production. "People know what they want, and they want beer. The craft beer industry is booming. It’s good for everyone. But in the long run, it will be the smart breweries that survive and thrive through changes in consumer preferences and spending. A brewery can do a number of things to position itself for long-term success. Among them is sustainability. Against the backdrop of rising energy and water costs, a leaner business that can deliver a quality product with less is a smarter business. At the same time, Joseph Six Pack grows increasingly environmentally conscientious. Craft beer is more than malt, hops, and yeast–it’s culture. Breweries that can differentiate themselves along real sustainability parameters will find an edge among consumers into the future. Sustainability is like beer; it’s good for everyone." The Green Brewery Project is a not-for-profit sustainability consulting venture focused on the craft brewing industry. The project originated as graduate research at the University of Michigan. Their mission is to offer creativity in energy and water systems analysis help breweries create stronger, more sustainable businesses. They work with established and start-up breweries across the country to zero in on high-leverage sustainability opportunities and make them a reality. They work with our breweries on resource use monitoring, renewable energy options, brewing system design for efficiency, brewing schedule optimization, water efficiency and waste water management, and anything else you can think of relating to energy or water in a brewery. Unlike your typical sustainability consultant, they actually understand how brewing systems work. For start-ups and expanding breweries, they sit down to determine what level of involvement is right to ensure [that venture} and “get it right” with the brewery design before investing. Their involvement can also help to attract investors who are eco-conscious and want to minimize operating costs down the line.